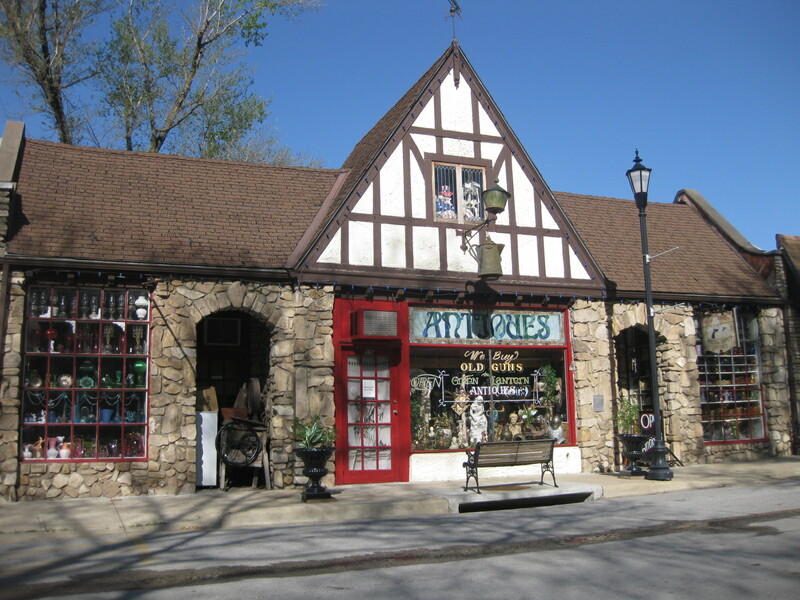 The stone buildings on Downing Street in Hollister, Missouri, across Lake Taneycomo from Branson, may be the largest assembly of commercial buildings constructed with the distinctive river stone and hewn limestone architecture found in the White River Valley of Missouri and Arkansas. Downing Street was placed on the National Register of Historic Places in 1979, as described in this article in the White River Valley Historical Society Quarterly. The latest restoration of The English Inn‘s restaurant and lodging rooms provides a fresh reason to visit Hollister. In addition, photographer Pat Lambert and several local plein air painters have opened a gallery on Downing Street, joining a variety of other interesting shops and the newly refurbished Little Hacienda restaurant. The completion of the railroad bridge over the White River in 1910, a few years before the completion of the dam that created Lake Taneycomo, spurred the creation of Hollister. A railroad station was soon built along with a block of commercial buildings nearby. 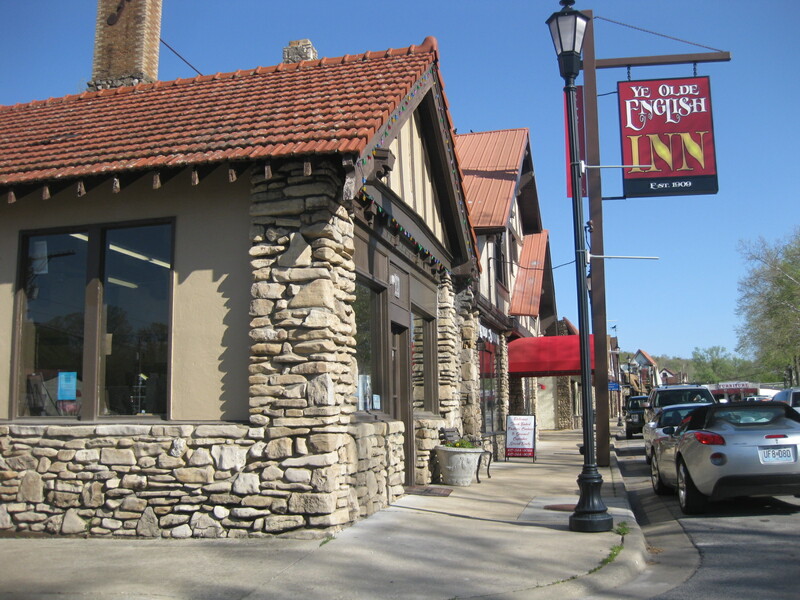 Grandpa’s first building in stone, commercial buildings in Hollister, including the The English Inn, was in limestone, the material of his traditional foundation and fireplace craft. His technique at first is obvious. With sledge and rock hammers, he pounded blocks into rough geometric shapes and laid them with little cement into rough forms. He mad his first crude arched doorways. By the time he moved to the ground floor interior of The English Inn, he had begun to develop a finer technique in cutting and laying the stone, but he was still pounding limestone with rock hammer and sledge into building blocks which he made into heavy block-shaped walls, relieved only by cavelike arched casements as heavy as the walls. But the ground floor had to be stone, because the developers had laid their town where no hill native would have built–in a creek bottom where it was subject to annual flooding. Above the ground floor, in second and third and fourth floors and attics, Grandpa turned to his traditional medium, wood, but the size and purpose of the building placed the building far outside the traditional craft. Accroding to order, he built exposed, mortised and tenoned oak beams framing stuccoed masonry, all topped by steep, many-gabled roofs–an Elizabethan fantasy in the turn-of-the-century Ozarks. Just sorth of what is now Ye Olde English Inn, you’ll find Green Lantern Antiques, displaying the metal casement windows and half-timbered gable that characterizes Downing Street. First step in building an arched stone entryway was to tear out the plywood and framing [which had covered a crudely-built entry]. Stone were broken with a sledgehammer then chipped out on either side to provide anchoring ledges for the arch. Recycled reinforcing rod is bent to shape in the blacksmith shop. Two bars are bent then short lengths are welded between. The arch frame is propped in place and stones laid up from either end. 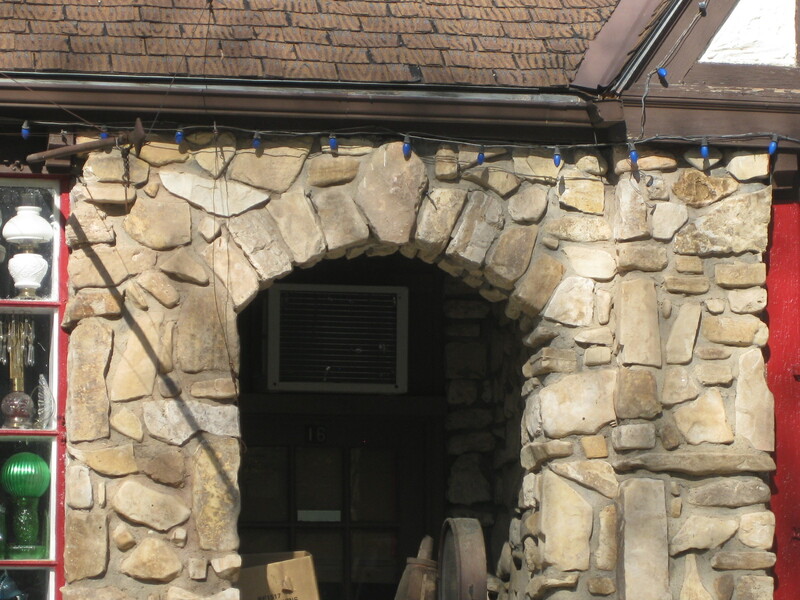 The frame must stay in place until the keystone is set and the mortar hardens partially. Then the rest of the stone can be laid. 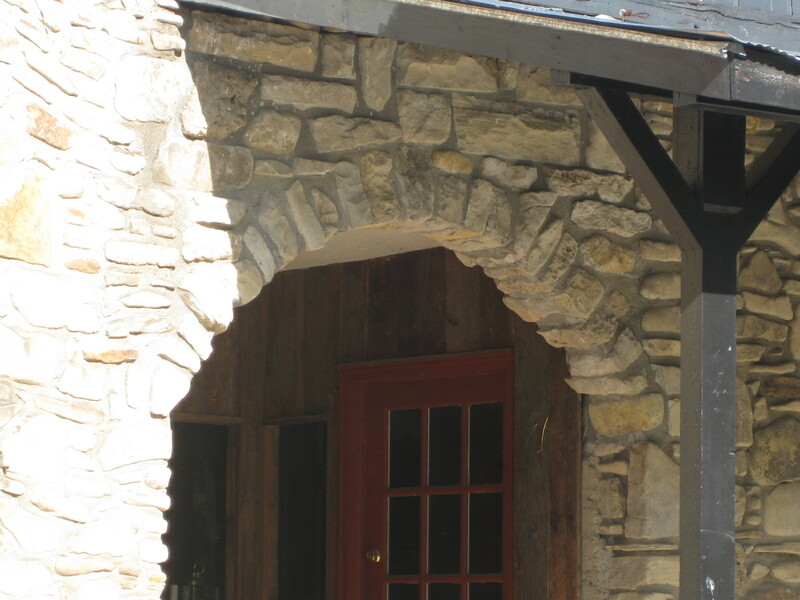 The completed arch of creekbed limestone blends with the older stonework. Well-crafted stone buildings may last a thousand years or more and enrich the landscape. What a contrast to how we build most things. Nice job counselor. In the beginning of the 20th century, masons would reinforce their masonry wythes with what steel was available. I have seen old stone walls with pieces of steel bed frames as reinforcing.